It’s time for a guest post. 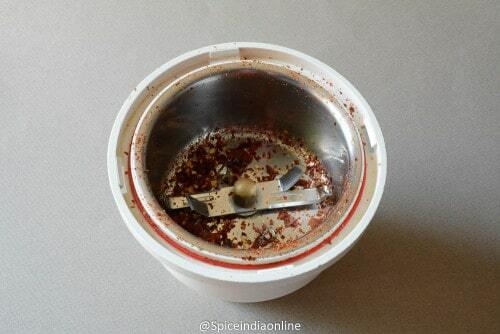 I am so happy to share this post written by Mullai Madhavan of SpiceIndiaOnline. She is one of my favorite blogger and a wonderful friend. I love all her recipes and she says they are simple recipes. But for me, all her recipes are lip-smacking and drool worthy. I like her detailed step by step explanation of the recipe and of course her pictures, oh boy those are worth zillion words. I am a big fan of her pictures. 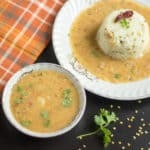 Today she is sharing one of my favorite recipes – Sabudana kichadi. 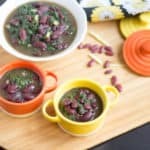 I have quite a few things to share about her, but I wanted to explain it another recipe post (a recipe that I bookmarked from hers). 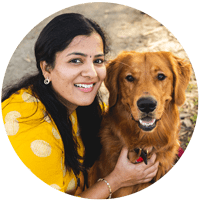 Before getting into the recipe, let me share website and social media details. 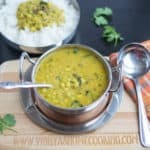 Hey everyone, this post is written up for one of my best friend, Vidhya, who discovered her own passion for making the best vegetarian dishes through her beautiful blog Vidhya’s Vegetarian Kitchen! We have known each other for quite some time and she has been a charmer ever since. She wanted me write a guest post for her blog and has been insisting for a very long time. 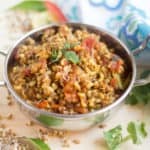 Today I’m sharing this humble dish called Sabudana Khichdi, a North Indian favorite at our home very ideal for breakfast or as a snack. Thanks Vidhya for the invite and wish you all the very best in everything! 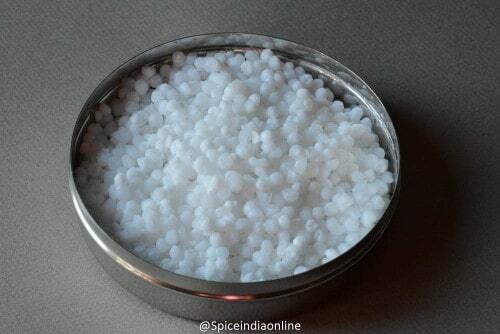 Soak Sabudana (Tapioca / Javarisi0 in water for 2 hours. Rinse once and sprinkle little water, let it sit covered overnight. Some variety takes less time while some may take longer. 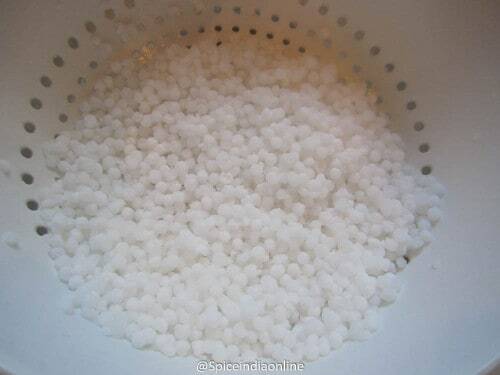 I usually soak them for few hours then drain all the water and let it rest overnight with few sprinkles of water. It will plump up the next morning and will be ready for use. Boil one medium size potato, cook it till soft but firm. Remove the skin and cut into tiny cubes and keep it aside. You can dry roast raw peanuts in a microwave – spread raw peanuts in a microwave safe plate and microwave for 1 minute and 30 seconds (1000 watts high power mode) Let cool completely and then rub off the skin. Soaked sabudana looks soft and when touched will feel slightly mushy. Keep this aside. Use your mixer pulse setting the run it twice to mince the chilies. Then add in the roasted peanuts to it. 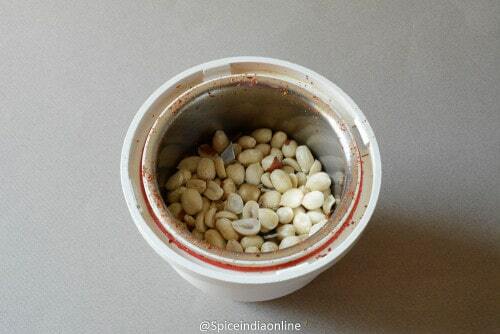 Again run your mixer under pulse setting twice to grind the peanuts to a coarse texture. Keep this ready. 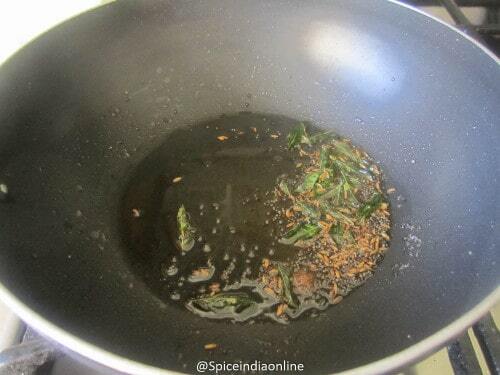 Heat oil in a kadai, splutter mustard seeds, cumin, and curry leaves. Add in chopped boiled potatoes. 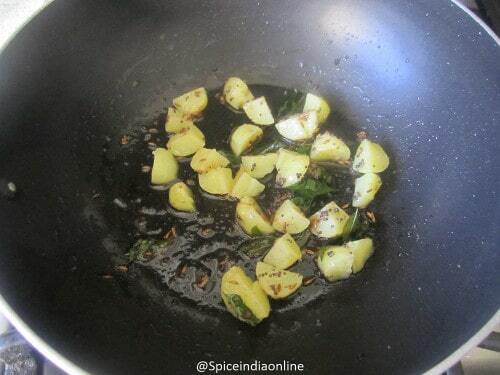 Fry for few seconds until it coats little oil over and gets firm. 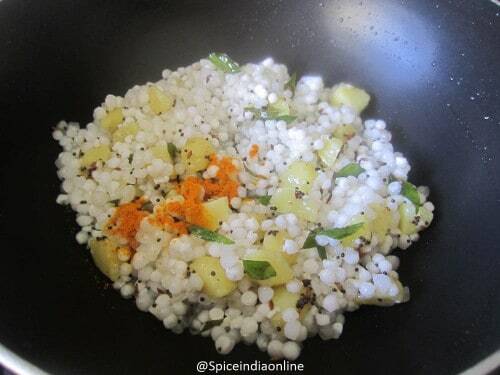 Add in the soaked sabudana at this stage. 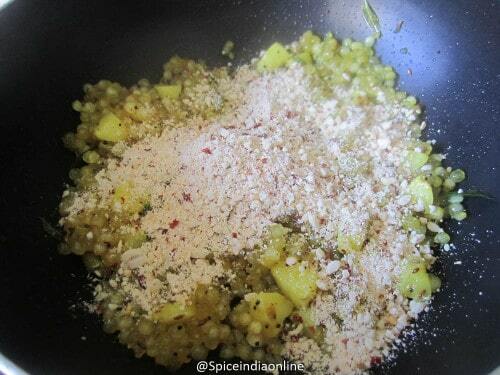 Add in turmeric powder and little-grated ginger. Saute for few minutes until the sabudana becomes transparent. It will have a glossy look and turns transparent. At this stage add the roasted peanut powder and salt. 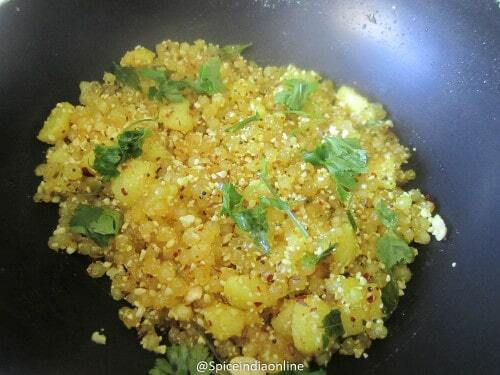 Give it a quick stir and garnish with chopped coriander leaves. Switch off. 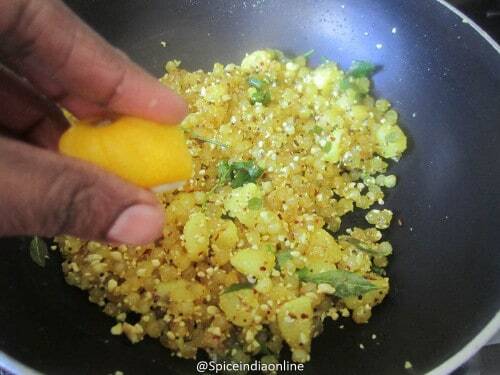 Squeeze in some lemon juice just before serving! 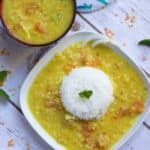 This dish is usually served as breakfast or snack and some have it during fasting season. 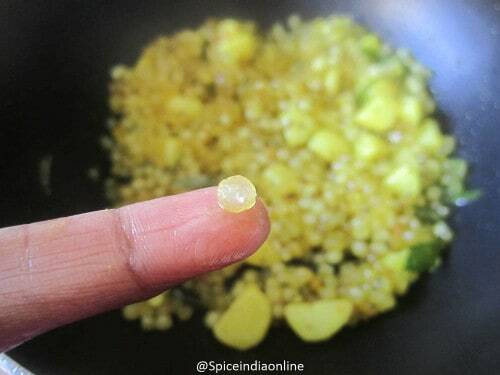 Makes 3 cups of cooked khichdi. Serves 2-3 adults. 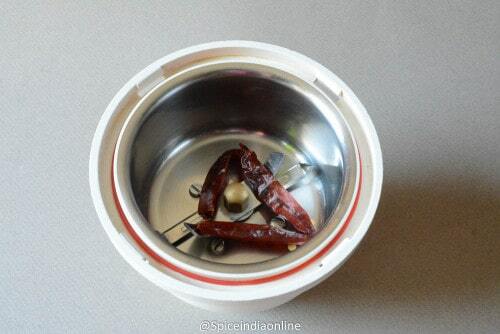 I personally prefer red chilies for heat, you may also use green chilies instead. Just chop them finely and use it. 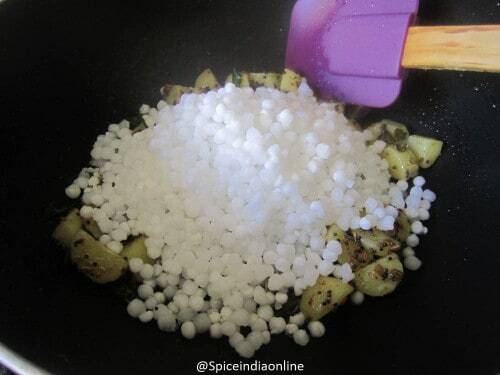 Do not over cook once you add the potatoes and tapioca, it will turn mushy. 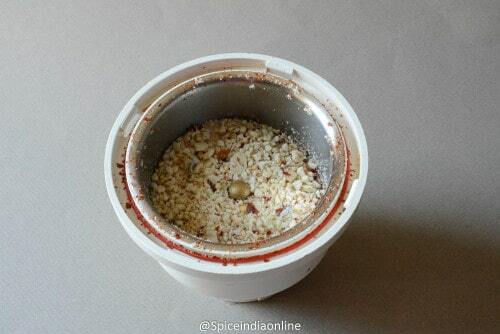 Peanuts should be coarse ground, fine powder can make the dish like a paste. I have roasted raw peanuts in microwave and then added to the dish. You may use ready made roasted peanuts instead. Wow, look so delicious. Loved it. Looks delightful :) Heading over to Mullai’s blog now! Thanks to Mullai. Please do try SS.